Quick hello to you from the other side of my recent hibernation, and thankfully with a new found bounce in my step again! Firstly, you can now order your very own team t-shirt and order multiples for friends, family and the cat next door. 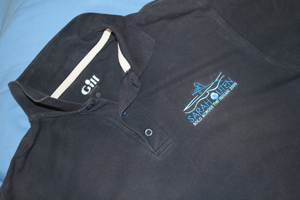 Navy blue, 100% cotton polo by Gill, with embroidered logo and threaded withvery happy vibes. Free delivery worldwide – I shall row them myself. Click here for your very own team t shirt. Secondly, I shall be joining my favourite Radio Boys Radcliffe & Maconie live in their Manchester studio this evening – BBC Radio 2 , 8 – 10 pm. Always a great crack – I am looking forward to meeting them for real. Thirdly, if you are in the Southampton area this weekend then pop along to the Southampton Boatshow and come and find Dippers and I, next to some very huge gin palaces down on the waterside. Worry not, Dippers is definitely the prettiest of them all. I have just had news to say she is safely off the big cargo boat which brought her back from M and I will be picking her up on Friday morning. I am more than a little excited. And finally… please wing me a shout out if you would like to book me for a talk to your school, club, business or anyone else you might like to share my tales of the ocean with, complete with photos and possibly a very special little boat. Hey Sarah. Glad to hear you are feeling slightly more normal. Sorry I can’t make it down to Southampton. It would have been great to see you there with Dippers. Hope it goes well. Love to come to the boat show, but unfortunately not. Hope you and Dippers have a great time! Link to Tee shirts not working!!! Just been listening to you on the radio – what a pro!!! Hi Sarah, Great to hear that you’ve bounced back on terra firma!! Happy travelling wherever life takes you… so much to explore …. so many adventures. Great to hear you last night, wonderful show. Look forward to meeting you on Sunday and seeing you, dippers and of course your Mum. You have so many followers now. Take care and enjoy your reunion with dippers. Great to hear you on the radio with the “boys” last night and can’t wait for the launch of the book next year – we’ll all be waiting anxiously for news of it I’m sure. Is there an overall figure that you have raised so far? No doubt you would be sad to see Serendipity sold but no doubt will always have fond memories of her. Take care and don’t overdo it. ps hope dippers has enjoyed her rest and is fully prepared for limelight and media stardom! lOVE to see your face when you first see DIPPERS bet the memoires will flood back. Enjoy the BOAT Show & have agreat reuion with DIPPERS ,Take Care & God Bless .Thanks again for keeping us all in touch with your journey TERRY B!!!!!!!! P.S. Already ordered aPOLO Shirt waiting in anticipation!!!! Thanks for keeping up your blog it’s great to hear how your doing and well done with the polo shirts they look great and I’ve just ordered mine.I’m part of the Warwick Round Table and we have a speaker night on 19th January( how’s that for notice!! )We meet at 7.30 and I was wondering if you’d be interested in talking to us about your adventure.? I appreciate it is a bit far for you to travel but if you could let me know the costs and if you’re available I’d appreciate it.Obvioulsly I’ll get the boys to put their hands in their pockets and support your charity. I’m hoping to see you at the Boat Show; anychance you will be there today, Friday 18th? hi sarah,following on from your mention of your”pirate”dog on the r&m show you might want to check out international talk like a pirate day which is tomorrow(saturday)it be great fun! Lovely to meet you at the boat show today and Dippers! It really confirmed what I already knew – that you are a lovely person. And Dippers is wonderful too. The photos came out well – thanks Sarah. Thanks to your friend who took some of them too! Good luck with the talk tomorrow and then a gradual return to normality and time to rest. Good luck with the book – I’ll look forward to reading it. PS. I have already ordered a polo shirt! It was great to see you today at the boat Show after all this time and to actually have a hug from the real folks. Do hope that you had a good journey back. What a credit you both are. Take good care and will be in touch, rioll on when the book coms out, have you started this list yet if now please put us on it. What a credit to you that so many folks came to visit and were so interested in your voyage of a lifetime. The first of many I guess. Love to you both, will be thinking of you all this coming week too.